Brie Larson's time as Carol Danvers is done, at least for now, as Captain Marvel wrapped shooting over the weekend. The actress celebrated the end of production with a special photo from the set. It shows the movie's slate signed by the cast and crew, along with a calendar that marks off the days of shooting. Other than the photo, the Oscar winner remained silent about the next Marvel adventure. Captain Marvel will be the next Phase 3 movie to hit theaters next year, arriving before Avengers 4 destroys theaters everywhere. The movie wrapped on Friday, the same day Marvel's latest, Ant-Man and the Wasp, opened in theaters. Captain Marvel will now go into post-production as it gears up for its exciting March release. Marvel boss Kevin Feige has called Brie Larson the next Robert Downey Jr. of the MCU, as she's poised to take over the next phase of Marvel movies, with many expecting her to save the day in Avengers 4. No plot details from either movie have really been shared at this time. But we do know that Carol Danver's first big screen outing will be a period piece that takes place in the 90s. Many fans believe that Captain Marvel is directly tied to Iron Man 2 and The Avengers. Others believe that Ant-Man and the Wasp has a secret Captain Marvel connection. While we've seen some leaked set photos of Brie Larson in her suit, we haven't really seen much else. Kevin Feige insists that a trailer is still months away, so don't expect any surprises at Comic-Con. Marvel is staying away from the convention this year for obvious reasons. 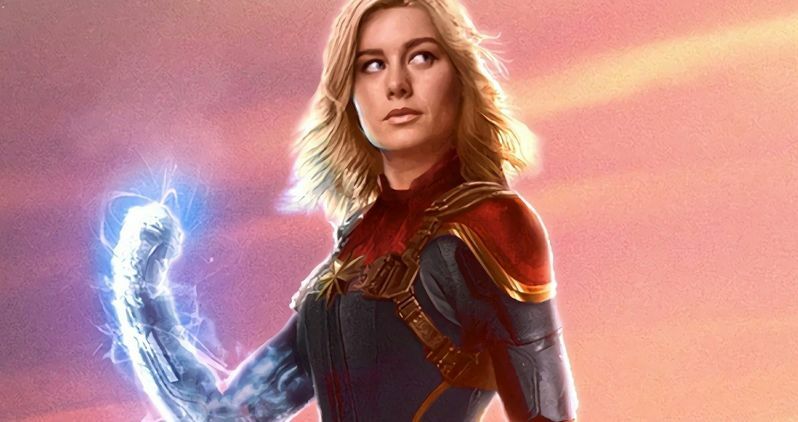 Filming on Captain Marvel begin way back in March, and lasted nearly five months. Larson will be joined by Samuel L. Jackson in the movie, who will be de-aged through the entire two-hour runtime. Also joining in on the fun are Gemma Chan, Annette Bening, Jude Law, and Ben Mendelsohn. Lee Pace is returning Guardians of the Galaxy villain Ronan the Accuser. The movie arrives as the 21st in the MCU. With a story set back in the 90s, we'll learn how Carol Danvers became one of the most powerful beings in the universe. She'll be caught in a fight between earth and two very different alien races. The waiting period between Ant-Man and the Wasp and Captain Marvel is one of the longest fans have had to endure since the gap between Avengers: Age of Ultron and Captain America: Civi War. In the meantime, we'll have plenty of Marvel surprises to look forward to in the near future. Will Captain Marvel be Marvel's next big thing? The studio's counting on it. Check out Brie Larson's Twitter photo.